Shop Baby Because online at BabyBecause.com for all your baby needs. BabyBecause promotes products to enhance the nurturing bond between mother and child with a collection of the highest quality alternative parenting products. Baby Because carries everything from cloth diapers to unique baby gifts and equipment, the BabyBecause catalog and online baby boutique have the very best including: strollers, baby skin care products, baby slings and carriers, nursing products, cloth diapers and diaper covers. Visit 58Coupons.com for the best BabyBecause coupons, BabyBecause savings, BabyBecause promotions and BabyBecause discounts for BabyBecause.com. Enter this coupon code to save 10% on your Purchase from BabyBecause.com. 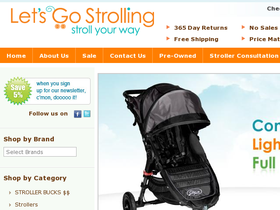 Get Free Shipping from BabyBecause.com on orders over $99. If your order doesn't hit the mark, you get flat rate shipping for just $5. Can't go wrong here folks. Use this coupon code online at BabyBecause.com to get a 10% discount on your purchase of $99 or more. Shop the sale section at Baby Because and you can save up to 25% off a wide range of baby stuff including toys, strollers, and more.